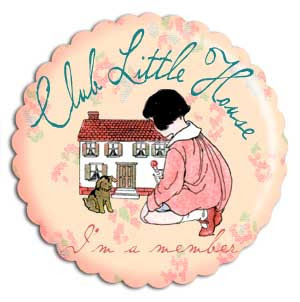 I’ve had some emails asking how I made the Club Little House rug and thought I’d share it with the other CLH members, too. How wonderful that you're enjoying the little rug in your dollhouse. Since I had to make multiple rugs and printable fabric isn’t cheap, I wanted to get more than one logo graphic on each sheet of printable fabric. So I copied the logo into a Word document and adjusted to get the size I wanted, then copied that initial design and pasted into the same Word document as many times as would fit on one page. Print—I used my HP color DeskJet printer. NOTE: Printable fabric isn’t cheap so think about other things you want to print on the fabric page as you’re probably only going to want to print one of the rugs. Maybe make another rug of a different design or a patch for a purse or clothing. I always try to conserve my printable fabric efforts. After you have your printed product, you need to treat the fabric which is super easy. My package said to rinse the printed fabric under cool water for a bit. Don’t wring it out or anything; instead, let as much water as possible drip off and then iron it dry (being careful not to burn your fabric). After it was dry, I embroidered the text bits. Then I cut out the rug, leaving some white space around it. I cut out a piece of felt fabric the same size and pinned the two together but you could also baste. I took a pair of scissors and cut around each one of the little scallops on the edge of the logo design—this kept both the rug top and backing the same. I tried using my scallop scissors but the rug design didn’t match the scale of the scallops on the scissors. And, if you closely look at the edge of the logon the right side, you’ll see it is different from the rest of the design. Now we come to a choice you can make that I wish I’d thought about when doing 24 of these rugs and my eyeballs were threatening to divorce me. I hand-stitched a simple blanket stitch around each rug to bind the two pieces together. If I’d thought about it, I would have used my sewing machine and tried a satin stitch—but I am not sure how that will work with all the little tiny scallop edgings and I just have a basic sewing machine. Here is a photo of a different rug I made for my dollhouse dining room using the basic same technique as above. However, I printed this design on printable canvas instead of cotton printable fabric because I wanted a semblance of woven texture. I did satin-stitch the edges on this rug. This slightly out-of-focus picture gives you an idea of the rug texture. I hope all this helps those of you wanting to make rugs for your dollhouse. It may not be quite a durable as store-bought, I make my own printable fabric by ironing cotton fabric onto freezer paper and trimming it to the size of a normal sheet of paper. Works like a charm. You can also treat the fabric beforehand with a product like Bubble Jet Set but I've never had problems with ink rubbing off. At least on decorative things. Thank you so much, June for sharing how you made the rugs. I can't get over the amount of work you did cutting out each scallop. I did a similar thing on the tags I made but it was only paper and much easier. And then all the hand stitching you did around each of the 24 rugs! What a trooper, you are, especially since you were willing to step in to do those extra 12 rugs when someone else was unable to contribute their little. I was one of the lucky recipients of a rug and I must say it is just gorgeous. Thank you so much! junie moon-you rock. i cannot wait to make some of these this weekend. i need plenty. Thank you June for your wonderful instructions. Back to JoAnn's I go for more supplies.